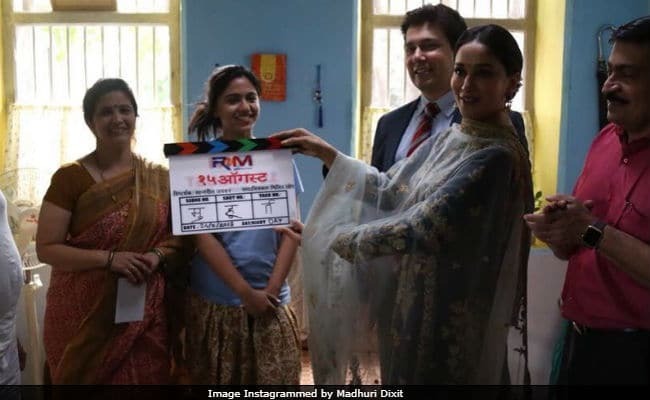 Madhuri Dixit, who is 'excited' about her new journey as a producer, shared a throwback picture of her from the first day on the sets as a producer on Instagram. In the picture, she can be seen giving the mahurat clap and is joined by her husband Dr Sriram Nene and the cast of her film. "Excited to get the chance to step behind the camera for our first RNM movie production," Madhuri captioned her post. For the occasion, Madhuri picked a heavy embroidered blue and golden anarkali suit while Dr Nene was all suited up. Last month, she shared a boomerang video of her and Mr Nene from the sets on Instagram and wrote, "Our producer's journey begins...Lights! Camera! Action!! 15th August. Starts shooting today. @RnMMovingPictures #originalcontent #comedy." The Tezaab actress is not only producing the untitled Marathi project but she is also starring as the lead actress. The film is scheduled to release on August 15, this year. Excited to get the chance to step behind the camera for our first RNM movie production. Take a look at their boomerang video. Speaking about the project, Madhuri had earlier told new agency IANS, "It is a story of every household yet it has a silver lining. It not only gives you hope and inspiration but also encourages you to live life in the true sense. The most fascinating factor for me to choose it is that it is going to carve a niche in everyone's heart." Madhuri Dixit started her career in Bollywood with 1984 film Abodh; she was just 16 at that time. In a career spanning over 34 years, Madhuri featured in over 75 films and went onto become one of the leading actresses of 90s. She even gave some memorable hits such as Saajan, Khalnayak, Hum Aapke Hain Koun..! and Dil To Pagal Hai among others. On October 17, 1999, Madhuri married a California-based surgeon Dr. Shriram Madhav Nene, in a private ceremony. Soon after the wedding, she relocated to Denver with her husband. The couple is parents to two sons - Arin and Rayaan. In 2011, she permanently moved back to Mumbai with her family. Madhuri was last seen in 2014 film Gulaab Gang. Her maiden production would also mark her debut as an actress in Marathi film industry.